What are the advantages of a VoIP telephone system? Cost saving is the main advantage that attracts businesses to VoIP. VoIP setups typically offer savings of around 30% against traditional phone systems. This amount can be much higher though as VoIP replaces the need for expensive phone lines as VoIP works over an organisation’s internet connection. VoIP telephone setups also support scale. It’s easy to expand VoIP systems simply by acquiring new phones or licences. This is particularly useful for telesales or customer service businesses, where either required expansion or seasonal fluxes in staff mean that there can be a sudden need to add handsets. There’s also the easy portability of lines and numbers. When staff move desk – or even office – their number can follow with them. No more confusing call routing – you’ll always reach the right person. And with VoIP from Akita and 3CX, you’ll never miss a call. Using the 3CX app, you can answer your desk phone from your mobile if you’re away from your desk. If you suddenly get called away and don’t want to be disturbed, you can also activate your voicemail or ‘do not disturb’ call routing remotely via email. What are the limitations of VoIP telephones? VoIP calls require a stable internet connection of a reasonable speed. Most organisations will have this as standard, but offices with only a basic internet setup may find that VoIP slows their systems down. And if your internet goes down, so does your phone system if you don’t have a backup. One other slight downside is also that a VoIP system will often require new phones. Traditional phones do not have the required Ethernet port. This is only a part downside however as VoIP phones often offer many advanced features that regular phones won’t have, such as Bluetooth connectivity, on-screen address books and hot desk settings. Many VoIP telephone packages allow for a certain number of minutes of calls. Stay below this amount and there are no additional costs. Calls outside of these packages will be chargeable but at a significantly reduced cost compared to traditional phone lines. With VoIP from Akita, calls to phones on the same network are free. And if a company is running a VoIP telephone setup at separate office locations via a cloud setup, calls between the two locations will be free – even if these offices are in different countries! A typical VoIP telephone setup will require either on an onsite switch unit (located in a server cab) or a virtually hosted switch that can route your phones. This will patch in to your existing internet connection. Once connected and licensed, phones can be added anywhere that there are Ethernet ports. Most phones will also have ‘through wiring’, so the phone and a desktop computer can be run off of just one port. If your bandwidth is good and Wi-Fi signal is strong, then VoIP phones can even run wirelessly. Can VoIP do more than calls? Yes. Depending on your provider VoIP can also support video calling and video conferencing. You can see who you’re speaking with and how they react, share your screen, present documents and give presentations. This easy-to-use service offers the ideal way to stay in touch with remote workers, key clients or satellite offices. When should I implement VoIP? Straight away! Joking aside, there’s no obstacle to a business making the change to VoIP. While an office move or staff expansion might be a driver for change, the sooner a company moves to a VoIP telephone system, the sooner it can start enjoying savings. Our hosted VoIP systems provide the full benefits of a VoIP telephone system without the need for associated servers and infrastructure hardware. With a Voice over IP (VoIP) solution from Akita and 3CX, you’ll not only get telephone calls but video capability as standard. 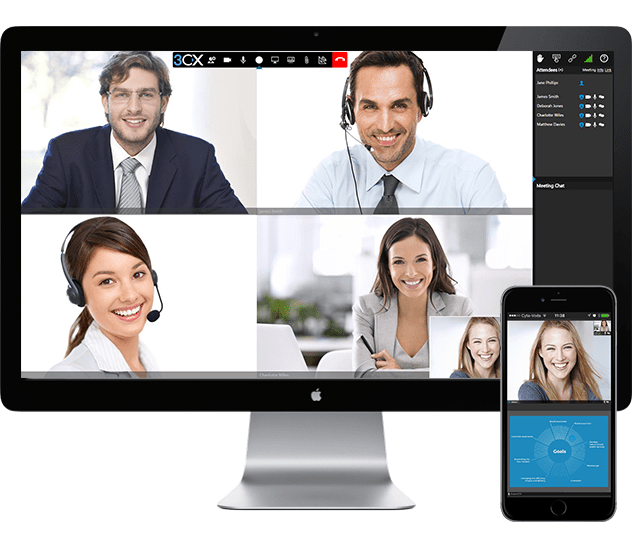 Unlock the potential of video calls and web conferencing for your business as part of your VoIP experience.